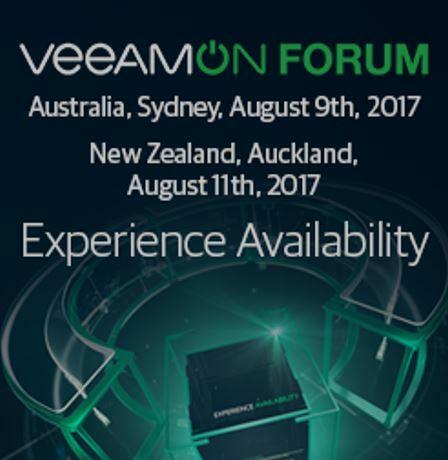 VeeamON Forum is Coming to Australia and New Zealand! In August, Sydney & Auckland will be hosting VeeamON Forum 2017 - the world’s premier Availability event. Not only will you get the latest in data Availability innovations, but you’ll have the chance to interact with industry leaders around the world, attend breakout sessions held by Veeam experts and listen to what industry-renowned speakers have to say. VeeamON Forum 2017 is THE place to be for those of you who love to learn new things. There will be technical and business breakout sessions conducted by Veeam experts from around the globe. The sessions will be divided into different topics, such as Veeam Availability Suite v10 and other future Veeam products, Availability trends, best practices and you’ll also hear from our key Sponsors. Expand your network and connect with IT peers, industry experts and Veeam’s top talent, and voice your opinion to help drive new Veeam innovations and support. As Co-CEO and President, Peter is responsible for the sales, sales operations, marketing, finance and human resources at Veeam, and his charter is to drive the company’s accelerated growth into the enterprise. His resume is second-to-none; prior to Veeam, Peter held a number of senior leadership roles within VMware's Americas organisation. If you would like to learn more about the conference or to register, visit the official VeeamON Forum 2017 registration page. We hope to see you in Sydney or Auckland!